VideoRay is a leader in observation class Remotely Operated Vehicles (ROVs) and, according to the company, the largest volume producer of ROVs in the world. 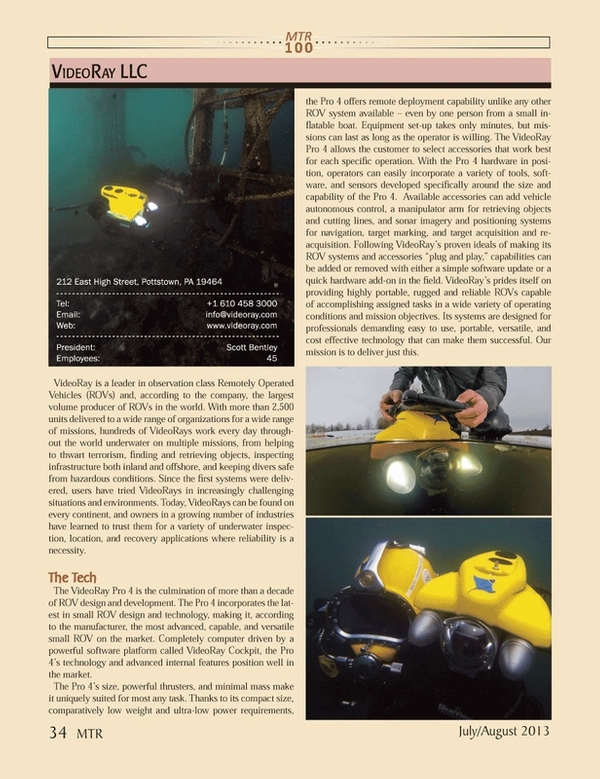 With more than 2,500 units delivered to a wide range of organizations for a wide range of missions, hundreds of VideoRays work every day throughout the world underwater on multiple missions, from helping to thwart terrorism, finding and retrieving objects, inspecting infrastructure both inland and offshore, and keeping divers safe from hazardous conditions. Since the first systems were delivered, users have tried VideoRays in increasingly challenging situations and environments. Today, VideoRays can be found on every continent, and owners in a growing number of industries have learned to trust them for a variety of underwater inspection, location, and recovery applications where reliability is a necessity. The VideoRay Pro 4 is the culmination of more than a decade of ROV design and development. The Pro 4 incorporates the latest in small ROV design and technology, making it, according to the manufacturer, the most advanced, capable, and versatile small ROV on the market. Completely computer driven by a powerful software platform called VideoRay Cockpit, the Pro 4’s technology and advanced internal features position well in the market. The Pro 4’s size, powerful thrusters, and minimal mass make it uniquely suited for most any task. Thanks to its compact size, comparatively low weight and ultra-low power requirements, the Pro 4 offers remote deployment capability unlike any other ROV system available – even by one person from a small inflatable boat. Equipment set-up takes only minutes, but missions can last as long as the operator is willing. The VideoRay Pro 4 allows the customer to select accessories that work best for each specific operation. With the Pro 4 hardware in position, operators can easily incorporate a variety of tools, software, and sensors developed specifically around the size and capability of the Pro 4. Available accessories can add vehicle autonomous control, a manipulator arm for retrieving objects and cutting lines, and sonar imagery and positioning systems for navigation, target marking, and target acquisition and reacquisition. Following VideoRay’s proven ideals of making its ROV systems and accessories “plug and play,” capabilities can be added or removed with either a simple software update or a quick hardware add-on in the field. VideoRay’s prides itself on providing highly portable, rugged and reliable ROVs capable of accomplishing assigned tasks in a wide variety of operating conditions and mission objectives. Its systems are designed for professionals demanding easy to use, portable, versatile, and cost effective technology that can make them successful. Our mission is to deliver just this.